Women and Children First’s women’s health groups discuss the problems that pregnant women may face and come up with solutions on how to prevent them. 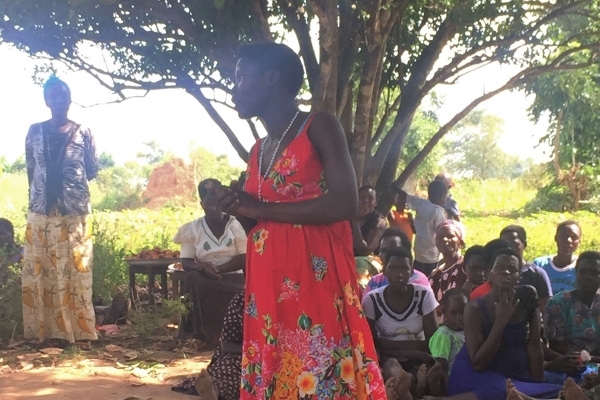 In Uganda, Monica, with other members of her women’s health group, have been told of the importance of attending their antenatal check-ups early. Starting antenatal care early - before 12 weeks - is important to ensure the health of pregnant women and their babies. It is a key moment for health workers to provide several tests and screenings, most effective in the early stages of pregnancy. Identify any complications that may occur during the pregnancy, such as blood loss, infections or developmental problems with their baby. Unfortunately, too many women in countries such as Uganda still lack awareness of their importance. Women’s health groups, set up by Women and Children First, helps raise their profile, and increases attendance levels. Since attending her women’s health group community meetings, Monica started going to her antenatal appointments. She learned what services she should be provided during her antenatal check-ups and when the health worker did not offer her folic acid, which is vital for baby’s brain development, she felt empowered to request it. Knowing that it was her right. The knowledge Monica gained from her women’s health group ensured that she is having a safe and healthy pregnancy. This is thanks to her community health group; supported by Women and Children First and generous donors like yourselves. Donate now to empower more women like Monica through our women’s health groups.